are from my experience with Olympic and national team athletes. Research findings relevant to stress reduction in sport are briefly described. Athletic performance is a complex set of cognitive, emotional, and motoric responses that have been shaped through learning experiences. The most important outcome is reflected in performance under competitive conditions. Performance during practice sessions, no matter how perfect, is considered to be a subgoal. Athletic performance is similar to other performing arts, including theater, dance, music, and public speaking, whereby the primary goal is to display one’s skills during the actual play, recital, concert, or public appearance, and the principles of psychomotor learning and performance are relevant to human performance in general (Domjan & Grau, 2003; Healy & Bourne, 1995; Schmidt & Wrisberg, 2000). Sport performances are influenced by several component elements: the strength of correct athletic responses, the presence of interfering incorrect responses, and the athlete’s level of transfer of responses from the practice environment to the competitive environment (Suinn, 1989). The level of potential skill and the pace of acquisition of such skill are influenced by factors such as the athlete’s genetic competencies, past exposure to sports training and performing (which teaches “learning to learn” athletic skills), the quality of coaching, training programs, nutritional planning, and so forth. For any single performance, other variables may restrict the level of actual achievement such as in the negative impact of jet lag, temporary health problems, or recent life stresses. Of major relevance to this article are the three components of correct responses, incorrect responses, and transferability of skills. Correct athletic responses involve those that make up the primary positive aspects of the sport: the motor skill itself, preparatory-arousal responses, cognitive or cueinstructional responses, and attentional– concentration responses. Incorrect athletic responses involve interfering motor habits, inappropriate arousal or conditioned emotionality, and negative cognitions. The transferability of responses from practice settings to competitive settings is a function of the nature of the practice and its similarity to game stimulus conditions. A high level of performance reflects a well-developed motor skill. In other words, the athlete will have learned the proper neuromuscular responses, sometimes identified as “proper technique,” such as the arm rotation that maximizes the force of a karate blow, or the quick explosive movement that initiates a rapid start, or the appropriate timing that defines the diving or gymnastic routine. Another type of correct response involves the preparatory-arousal sequence, that is, the achievement of the athlete’s optimal level of activation (Gould, 1994; Tenenbaum, 2003). This concept involves the Yerkes–Dodson “inverted-U” law, which demonstrates an optimal level of arousal, with levels above or below being associated with poorer performance (Hanin, 2000; Yerkes & Dodson, 1908). Thelwell and Maynard (1998) and Woodman, Albinson, and Hardy (1997) each conducted studies comparing performances within versus outside ones’ optimal arousal level. They found that ratings of performances or actual game scores were both better when “in the optimal zone.” Cue-instructional responses include such cognitive responses as game strategies or thought stimuli associated with triggering complex motor responses. In the latter case, the self-instruction of “be loose and dynamic” may precipitate simultaneously a muscular event, effort, style, and an emotional response. Finally, attentional– concentration responses are those that focus the neuromuscular and sensory–perceptual states to a narrowed set of cues and an equally narrowed set of responses related to the special demands of the competition (Moran, 1996). Kerr and Leith (1993) were successful in the use of self-talk or self-instructional procedures to improve performances as well as increase the attentional skills of competitive gymnasts. self-efficacy (“I’m not good enough”). Recent data on athletics has confirmed that efficacy is indeed predictive of athletic performance. For instance, individual efficacy was predictive of performance of athletic tasks early in training, and team efficacy was associated with higher performance during actual competition (Feltz & Mugno, 1983; McAuley, 1985; (Myers, Feltz, & Short, 2004). an optimal level of anxiety can be measured for individual athletes, this level falling within one half of a standard deviation of the athlete’s anxiety test score. Research based on this hypothesis has produced mixed results (Halvari, 1996; Hanin, 2000; McNally, 2002; Thelwell & Maynard, 1998). Whether the presence of anxiety is viewed as facilitative or potentially debilitating also seems a matter of appraisal. For instance, elite athletes tended to interpret their anxiety symptoms as more facilitative than athletes with lower skill (Eubank & Collins, 2000; Hanton & Maynard, 2004; G. Jones, Hanton, & Swain, 1994; G. Jones & Swain, 1995; Swain & Jones, 1996). Despite the possible facilitative contributions of anxiety, reducing anxiety’s debilitating effects is of major interest to applied sport psychologists. Anxiety reduction has been the center of attention for nearly every possible type of sport, such as field hockey, gymnastics, sport parachuting, shooting, soccer; swimming, tennis, and volleyball (Fenz, 1988; Hanton, 2001; Holt & Hogg, 2002; Jiang, Zhu, & Liu, 1999; Kolt, Hume, Smith, & Williams, 2004; Lanning & Hisanaga, 1983; Maynard & Cotton, 1993; Maynard, Smith, & Warwick-Evans, 1995; Perna, Antoni, Baum, Gordon, & Schneiderman, 2003; Terry, Coakley & Karageorghis, 1995; Ward, 1997). race or game or fight is lost, or even continuously wondering if fatigue will set in before the event is complete. Park (2004) identified a number of internal stressors including negative thoughts, high expectations, fear of failure, and lack of self-confidence. Gould et al.’s (1993) finding also highlighted the existence of self-doubt as a stressor, and Scanlon et al. (1991) confirmed the relevance of worries about failure as a stressor. explored with various athletes for reducing effects of trauma, increasing pain tolerance, or controlling anxiety (Bauman & Carr, 1998; Blacksmith, 1977; Dorsey, 1977; Etter, 1980; Heyman, 1987). Oglesby (1999) used a variant of desensitization with 48 college varsity athletes involved in field hockey, gymnastics, lacrosse, track and field, or volleyball. Although no significant changes in a paper-and-pencil state–trait anxiety measure were found, significant reductions in subjective self-ratings of anxiety associated with memories of their “worse moment in sports” were identified for the group treated for anxiety compared with the placebo group. A third approach conditions new responses or associates a new “meaning” to the initial stressor. Prior to the 1980 Summer Olympics in Moscow, athletes and coaches were concerned about the extreme Russian nationalism and the negative feelings that could be activated by the sights and sounds of the Russian stadium. A classical conditioning program was developed, whereby the sight of red (as in the Russian flag) was paired with feelings of competency and readiness to perform at peak levels. Because these Summer Games were canceled for U.S. athletes, the training was not completed. On the other hand, a similar approach was successfully used with members of a university women’s volleyball team in preparation for a series with the UCLA basketball team. The UCLA team members were perceived to be unusually talented, strong, and tall, and to be unbeatable. Suinn (1984, 1997) used an imagery-rehearsal method, visuomotor behavior rehearsal (VMBR), to assist the women to more accurately judge the UCLA team: What do they really look like in “real life” stripped of their reputation? Self-report results suggested that the VMBR helped the athletes reduce their anxieties about facing UCLA. Imagery-rehearsal techniques have been used extensively for sport performance enhancement (for reviews, see Driskell, Copper, & Moran, 1994; Feltz & Landers, 1983; Suinn, 1997). Lowther & Lane, 2002). Some sport psychologists have suggested that anxiety and stress can either influence fatigue directly or affect mood states, which in turn create fatigue or energy loss. Perna, Antoni, Kumer, Cruess, & Schneiderman (1998) hypothesized that stress would be associated not only with negative moods but also with loss of energy. They provided a cognitive– behavioral stress management program to rowers focused on controlling thoughts and maintaining relaxation. Their results showed a reduction in both depressed mood and fatigue and reduced salivary cortisol after the 4-week intervention. The presence of errors or the onset of fatigue cues need not always be associated with a stress sequence. Mahoney and Avener (1977) discovered that successful Olympic gymnasts differed from less successful ones in terms of their responses following an error. The successful athletes used the error as information to plan the next sequence of moves; the unsuccessful athletes were emotionally reactive or ruminative about the error. Morgan (1984), in his studies of marathon runners, concluded that an “associational” style was preferable in effective running. In the associational style, the runner continuously monitors his or her physical state, using the bodily signals as data for making adjustments in running, to maintain a steady state. Morgan referred to this as a “pay as you go” (p. 313) method for expending energy while achieving pace. Poor runners ignore their physical signals and instead run harder earlier to achieve a fast pace, but they then wear down and eventually lack energy to complete the race; these are the “buy now, pay later” (p. 313) runners. Thus, as confirmed in both the gymnast and marathon studies, error or bodily signals can serve either as triggers for further stress or as signals for adapting one’s subsequent behavior. Suinn, Morton, and Brammell (1979) trained cross-country runners to identify early signs of fatigue, then to cue off a relaxed style of running, using a combination of relaxation training, VMBR, and thought cuing. Data on oxygen consumption during treadmill testing confirmed that athletes can alter their styles to reduce oxygen utilization, signifying greater physiological efficiency. 2004). In addition, biofeedback has been studied as a means for controlling anxiety disorders as well as situational stress arising from medical procedures (Chang & Hiebert, 1989; Fahrion & Norris, 1990; Ryan & Gevirtz, 2004; Schwartz & Andrasik, 2003). Some studies have examined the influence of biofeedback for various types of performance, such as public speaking, music performance, and sport performance. Hickerson (1998) reported biofeedback training increased participants’ control of physiological stress symptoms (heart rate, breathing) and improved ability to give public speeches. Niemann, Pratt, and Maughan (1993) also used biofeedback and coping training for relaxation among musicians and reported reductions in debilitative anxiety. Prapavessis, Grove, McNair, and Cable (1992) used a combination of biofeedback, thought stopping, and muscle relaxation with a rifle shooter in a single-case design. Anxiety levels, gun vibration, heart rate, and urinary catecholamines decreased, and self-confidence and performance increased over the 6-week intervention. In another study, Strack (2003) reported the biofeedback intervention baseball group achieved a 60% improvement in batting practice results compared with a 21% improvement of the control group even though there were no significant differences in anxiety. Anxiety management training (AMT; Suinn, 1990) involves training in the direct use of relaxation under conditions of arousal, including anxiety arousal, anger arousal, or other impulse activation. During AMT, the athlete visualizes the disturbing situation, permitting the situation to precipitate the physiological arousal. Relaxation is then initiated to reduce heart rate, respiration, and other indicators of physiological arousal. AMT for multiple stressors was applied with the U.S. Modern Pentathlon Team. In the Modern Pentathlon, athletes compete in five events: shooting, running, swimming, riding, and fencing. Because each event is very different, stress management training would be extremely lengthy were such training to target each of the events separately. AMT provided a coping approach that controlled maladaptive arousal regardless of the situation prompting the arousal. AMT was used with one pentathlete who experienced stress reactions in pistol shooting, fencing, and horseback riding. Following an abbreviated training, the athlete developed sufficient AMT skills as to win against an international field, including a former bronze medalist. actually reflect excessive autonomic–physiological arousal or cognitive stressors. However, where the stress responses seem focused primarily on the somatic– behavioral domain, then certain stress management procedures are appropriate. If the stress appears as tightness and rigidity, then simple relaxation or breathing exercises may be useful, including the Jacobsen deep muscle relaxation technique (Jacobsen, 1938; Suinn, 1980a). Maynard and Cotton (1993) compared applied relaxation with positive thought training on measures of somatic and cognitive anxiety. The relaxation intervention led to a 32.7% reduction in somatic anxiety compared with 16.7% from the cognitive treatment. The cognitive intervention resulted in a 31.9% improvement in cognitive anxiety compared with 13.9% from the applied relaxation treatment in a field setting. This study, like others described later in this article, highlights the specificity of treatment effectiveness. Where the anxiety appears as uncoordinated, restless activity, the recommendation could be for the athlete to engage in motor behaviors opposite to these, such as more deliberate and slow-paced walking, less rapid speech, or slow-motion arm movements. Using this method, more controlled neuromuscular feedback signals will be transmitted internally. In some cases, an athlete lacks the sensitivity to know when muscles are relaxing. In such instances, I have paired up athletes, with one person putting his or her hands on the shoulders of the other. Sensing this weight, the athlete preparing to relax can then monitor shoulder muscle relaxation by feeling the shoulders lower under the combined weight and relaxation exercise. Occasionally the athlete’s stress response involves motor constriction and loss of free range of movements. With one wrestler, this appeared in his grabbing and holding on rather than fluidly using different throws or holds. To counter this tendency to freeze, I had him begin each match with broad, exaggerated, wide-ranging motions in order to cue freer movements. to understand that “at least you’ve made progress in ruling this area out, so you are systematically progressing toward a solution,” as opposed to feeling that nothing effective has been achieved. Positive thought control involves the use of self-instruction to cue off adaptive behaviors and to replace interfering useless thoughts (Suinn, 1987). Negative self-talk generally involves ambiguous, urging, but directionless self-instructions such as “Pay attention and concentrate, dummy.” A selfinstructional positive correction might therefore be “Here’s an approach shot, just stroke it across court.” Maynard et al. (1995) provided positive thought control training involving strengthening positive thoughts and controlling the appearance of negative thoughts. Participants were semiprofessional soccer players. Performance measures involved coaches’ ratings of physical skills, such as accuracy of passing, and ratings of decision-making skills, such as knowing when to pass. Results showed that the cognitive intervention increased both physical and decision-making performance along with reducing anxiety. Terry et al. (1995) used imagery rehearsal to train young tennis players to replace negative images with positive ones and also found reductions in anxiety. A variation of positive thought control focuses more on isolating the negative thought rather than emphasizing positive self-instruction. Thoughtstopping involves instructing the athlete to actively stop a negative thought from developing further. A simple strategy might be to picture “a large bright stop sign” to halt the thought. I have sometimes instructed an athlete to picture these thoughts as being placed in a “compartment in your mind, where you now shut the door on them until the competition is over” or to picture these thoughts as “running through your head, straight through your head, and out . . . and gone.” In attentional refocusing, the athlete stops attending to stress stimuli (such as staring at the starting area) and instead attends to a nonstress stimulus (such as conversing with a friend). This method has applications as well to negative thoughts. One skier on the U.S. National Cross-Country Ski Team kept thinking, “I’m not smooth on hill climbing, hills are always a problem.” As a consequence, when she approached a hill she exerted extra effort, would lose her rhythm, ski poorly, and confirm her worst fears. Prior to the next race, I instructed her to instead search for the tallest tree on each hill she approached. This not only refocused her attention on new thoughts, thereby displacing the negative ones, but also raised her head higher and freed up her breathing. This performance helped her earn a third place finish, making up for an extremely poor initial run. The laboratory study by Dugdale and Ecklund (2002) previously cited used a cue word ball to refocus the participant’s attention on adaptive behaviors. Similarly, Rushall, Hall, Roux, Sasserville, and Rushall (1989) found that using cue words to key off task-relevant behaviors improved performance among skiers. acquisition and performance. 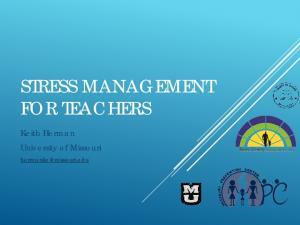 Stress management skills require training and practice and repeated successful applications in the performance context. Knowledge of stress management is no guarantee of the skilled application of such activities. In addition, it is important to consider stress management as self-control training. The eventual goal is the ability of the competitor to initiate stress management through his or her own skills and to not have to rely upon the presence of the psychologist. In sum, stress management can be an important contributor either to the performance of an athlete or to the satisfaction experienced by an athlete. Proper assessment of the individual circumstances is critical to program planning for stress. Such assessment has to encompass not only consideration of the stress characteristics of the athlete in question but also the ruling out of other nonstress factors that might contribute to the presenting difficulties. Various stress management approaches are available with varying degrees of research or case history validation. A proper match and training in such approaches can enhance athletic endeavors for athletes of all levels. REFERENCES Alberto, P., & Troutman, A. (1999). Applied behavior analysis for teachers. Upper Saddle River, NJ: Merrill. Anshel, M., Porter, A., & Quek, J. (1998). Coping with acute stress in sport as a function of gender: An exploratory study. Journal of Sport Behavior, 2, 363–376. Barlow, D. (2002). Anxiety and its disorders: The nature and treatment of anxiety and panic. New York: Guilford Press. Bauman, N., & Carr, C. (1998). A multi-modal approach to trauma recovery: A case history. In Kate Hays (Ed. ), Integrating exercise, sports, movement and mind: Therapeutic unity (pp. 145–160). Binghamton, NY: Haworth Press. Beck, Aaron, T. (1985). Anxiety disorders and phobias: A cognitive perspective. New York: Basic Books. Blacksmith, W. (1977). The effect of systematic desensitization on pre-match anxiety states among collegiate wrestlers. Dissertation Abstracts International, 38 (04), 1974A. Burton, D. (1990). Multimodal stress management in sport: Current status and future directions. In J. Jones & L. Hardy (Eds. ), Stress and performance in sport (pp. 171–202). New York: Wiley. Carlson, J. (2003). Complementary therapies and wellness: Practice essentials for holistic health care. Upper Saddle River, NJ: Prentice Hall. Carver, C., Scheier, M., & Weintraub, J. (1989). Assessing coping strategies: A theoretically based approach. Journal of Personality and Social Psychology, 56, 267–283. Chang, J., & Hiebert, B. (1989). Relaxation procedures with children: A review. Medical Psychotherapy: An International Journal, 2, 163–176. Craske, M. (1999). Anxiety disorders: Psychological approaches to theory and treatment. Boulder, CO: Westview Press. Davidson, R., & Schwartz, G. (1976). The psychobiology of relaxation and related states: A multiprocess theory. In D. Mostofsky (Ed. ), Behavior control and modification of physiological activity (pp. 399 – 442). Englewood Cliffs, NJ: Prentice Hall. Deffenbacher, J., & Suinn, R. (1987). Concepts and treatment of the generalized anxiety syndrome. In L. Ascher & L. Michelson (Eds. ), International handbook of assessment and treatment of anxiety disorders (pp. 332–360). New York: Guilford Press. Domjan, M., & Grau, J. (2003). The principles of learning and behavior (5th ed.). Belmont, CA: Wadsworth. Dorsey, J. (1977). The effects of biofeedback-assisted desensitization training on state anxiety and performance of college age male gymnast. Dissertation Abstracts International, 37 (09), 5680A. Driskell, J., Copper, C., & Moran, A. (1994). Does mental practice improve performance? Journal of Applied Psychology, 79, 481– 492. Dugdale, J., & Ecklund, R. (2002). Do not pay any attention to the umpire: Thought suppression and task-relevant focusing strategies. Journal of Sport and Exercise Psychology, 24, 306 –319. Ebert, M., Loosen, P., & Nurcombe, B. (Eds.). (2000). Current diagnosis and treatment in psychiatry. New York: Lange Medical Books/McGraw-Hill. Edelman, R. (1992). Anxiety: Theory, research, and intervention in clinical and health psychology. New York: Wiley. Ellis, A. (1996). Better, deeper, and more enduring brief therapy: The rational emotive behavior therapy approach. New York: Brunner/Mazel. Etter, T. (1980). Pain tolerance applied to the athletic environment. Dissertation Abstracts International, 41 (05), 2006A. Eubank, M., & Collins, D. (2000). Coping with pre- and in-event fluctuations in competitive state anxiety: A longitudinal approach. Journal of Sports Sciences, 18, 121–131. Fahrion, S., & Norris, P. (1990). Self-regulation of anxiety. Bulletin of the Menninger Clinic, 54, 217–231. Feltz, D., & Landers, D. (1983). The effects of mental practice on motor skill learning and performance: A meta-analysis. Journal of Sport Psychology, 5, 25–27. Feltz, D., & Mugno, D. (1983). A replication of the path analysis of the causal elements in Bandura’s theory of self-efficacy and the influence of autonomic perception. 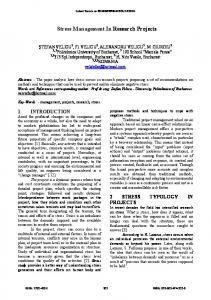 Journal of Sport Psychology, 5, 58 –71. Fenz, W. (1988). Learning to anticipate stressful events. Journal of Sport & Exercise Psychology, 10, 223–228. Freeman, A., Pretzer, J., Fleming, B., & Simon, K. (2004). Clinical applications of cognitive therapy (2nd ed.). New York: Plenum Press. Freeman, L. (Ed.). (2004). Mosby’s complementary and alternative medicine (2nd ed.). St. Louis, MO: Mosby. Gill, D. (2000). Psychological dynamics of sport and exercise. Champaign, IL: Human Kinetics. Gould, D. (1994). Psychological skills for enhancing performance: Arousal regulation strategies. Medicine & Science in Sports & Exercise, 26, 478 – 485. Gould, D., Ecklund, R., & Jackson, S. (1992). 1988 U.S. Olympic wrestling excellence: II. Thoughts and attitudes occurring during competition. The Sport Psychologist, 6, 383– 402. Gould, D., Jackson, S., & Finch, L. (1993). Sources of stress in national champion figure skaters. Journal of Sport and Exercise Psychology, 15, 134 –159. Halvari, H. (1996). Effects of mental practice on performance are moderated by cognitive anxiety as measured by the Sport Competition Anxiety test. Perceptual & Motor Skills, 83, 1375–1383. Haney, C. (2004). Stress-management interventions for female athletes: Relaxation and cognitive restructuring. International Journal of Sport Psychology, 35, 109 –118. Hanin, Y. (2000). Individual zones of optimal functioning (IZOF) model: Emotion–performance relationships in sport. In Y. Hanin (Ed. ), Emotions in sport (pp. 65– 89). Champaign, IL: Human Kinetics. Hanton, S. (2001). The relationship between psychological skills usage and competitive anxiety responses. Psychology of Sport & Exercise, 2, 89 –101. Hanton, S., & Maynard, I. (2004). Competitive anxiety responses in the week leading up to competition: The role of intensity, direction and frequency dimensions. Psychology of Sport & Exercise, 5, 169 –181. Healy, A., & Bourne, L. (Eds.). (1995). Learning and memory of knowledge and skills: Durability and specificity. Thousand Oaks, CA: Sage. Healy, A., Wohldmann. E., Bourne, L. (2005). The procedural reinstatement principle: Studies on training, retention and transfer. In A. Healy (Ed. ), Experimental cognitive psychology and its applications: Decade of behavior (pp. 59 –71). Washington, DC: American Psychological Association. Hersen, M., & Turner, S. (2003). Adult psychopathology and diagnosis (4th ed.). Hokoken, NJ: Wiley. Heyman, S. (1987). Research and interventions in sport psychology: Issues encountered in working with an amateur boxer. Sport Psychologist, 1, 208 –223. Hickerson, J. (1998). A biofeedback/cognitive– behavioral treatment for women with public speaking anxiety. Dissertation Abstracts International, 58 (08), 3308A. Holt, N., & Hogg, J. (2002). Perceptions of stress and coping during preparations for the 1999 women’s soccer World Cup finals. Sport Psychologist, 16, 251–271. Hooper, S., MacKinnon, L., & Hanrahan, S. (2003). Mood states as an indication of staleness and recovery. International Journal of Sport Psychology, 28, 1–12. Jacobsen, E. (1938). Progressive relaxation. Chicago: University of Chicago Press. Jiang, B., Zhu, B., & Liu, Z. (1999). A comparative study of two techniques of coping with competitive state anxiety. Psychological Science, 22, 233–236. Jones, G., Hanton, S., & Swain, A. (1994). Intensity and interpretation of anxiety symptoms in elite and non-elite sports performers. Personality and Individual Differences, 17, 657– 663. Jones, G., & Swain, A. (1995). Predispositions to experience debilitative and facilitative anxiety in elite and nonelite performers. Sport Psychologist, 9, 201–211. Jones, J., & Hardy, L. (1990). Stress and performance in sport. New York: Wiley. Kazdin, A., & Weisz, J. (Eds.). (2003). Evidence-based psychotherapies for children and adolescents. New York: Guilford Press. Kendall, P. (Ed.). (2000). Child and adolescent therapy: Cognitive–behavioral procedures (2nd ed.). New York: Guilford Press. Kerr, G., & Leith, L. (1993). Stress management and athletic performance. Sport Psychologist, 7, 221–231. Kleine, D. (1990). Anxiety and sport performance: A meta-analysis. Anxiety Research, 2, 113–131. Kolt, G., Hume, P., Smith, P., & Williams, M. (2004). Effects of a stress-management program on injury and stress of competitive gymnasts. Perceptual & Motor Skills, 99, 195–207. Koocher, G., Norcross, J., & Hill, III., S. (Eds.). (2005). Psychologists’ desk reference. New York: Oxford University Press. Lanning, W., & Hisanaga, B. (1983). A study of the relation between the reduction of competition anxiety and an increase in athletic performance. International Journal of Sport Psychology, 14, 219 –227. Lavallee, D., Kremer, J., Moran, A., & Williams, D. (2004). Sport psychology: Contemporary themes. New York: Macmillan. Lazarus, R. (1998). Fifty years of research and theory by R. S. Lazarus: An analysis of historical and perennial issues. Mahwah, NJ: Erlbaum. Lowther, J., & Lane, A. (2002). Relationships between mood, cohesion and satisfaction with performance among soccer players. Athletic Insight: Online Journal of Sport Psychology, 4(3). Retrieved 2002 from www.athleticinsight.com. Mahoney, M., & Avener, M. (1977). Psychology and the elite athlete: An exploratory study. Cognitive Therapy and Research, 1, 135–141. Martens, R., Vealey, R., & Burton, D. (1990). Competitive anxiety in sport. Champaign, IL: Human Kinetics. Maynard, I., & Cotton, P. (1993). An investigation of two stress-management techniques in a field setting. Sport Psychologist, 7, 375–387. Maynard, I., Smith, M., & Warwick-Evans, L. (1995). The effects of a cognitive intervention strategy on competitive state anxiety and performance in semiprofessional soccer players. Journal of Sport & Exercise Psychology, 17, 428 – 446. McAuley, E. (1985). Modeling and self-efficacy: A test of Bandura’s model. Journal of Sport Psychology, 7, 283–295. McNally, I. (2002). Contrasting concepts of competitive state-anxiety in sport: Multidimensional anxiety and catastrophe theories. Athletic Insight: Online Journal of Sport Psychology, 4, Retrieved August 2002 from www.athleticinsight,com. Moran, A. (1996). The psychology of concentration in sport performance. East Sussex, England: Psychology Press. Morgan, W. (1984). Mind over matter. In W. Straub & J. Williams (Eds. ), Cognitive sport psychology (pp. 311–316). Lansing, NY: Sport Science Associates. Murphy, S. (Ed.). (1995). Sport psychology interventions. Champaign, IL: Human Kinetics. Myers, N., Feltz, D., & Short, S. (2004). Collective efficacy and team performance: A longitudinal study of collegiate football teams. Group Dynamics, 8, 126 –138. Niemann, B., Pratt, R., & Maughan, M. (1993). Biofeedback training, selected coping strategies, and muscle relaxation interventions to reduce debilitative musical performance anxiety. International Journal of Arts Medicine, 2, 7–15. Nutt, D., & Ballenger, J. (Eds.). (2003). Anxiety disorders. Malden, MA: Blackwell Science. Oglesby, C. (1999). An investigation of the effect of eye movement desensitization reprocessing on states of consciousness, anxiety, self-perception, and coach-perceived performance ratings of selected varsity collegiate athletes. Dissertation Abstracts International, 60 (3), 1292B. Orlick, T. (2000). In pursuit of excellence (3rd ed.). Champaign, IL: Human Kinetics. Park, J. (2004). The perceived sources of competitive stress in Korean national athletes. International Journal of Sport Psychology, 35, 207–231. Perna, F., Antoni, M., Baum, A., Gordon, P., & Schneiderman, N. (2003). Cognitive behavioral stress management effects on injury and illness among competitive athletes: A randomized clinical trial. Annals of Behavioral Medicine, 25, 66 –73. Perna, F., Antoni, M., Kumar, M., Cruess, D., & Schneiderman, N. (1998). Cognitive– behavioral intervention effects on mood and cortisol during exercise training. Annals of Behavioral Medicine, 20, 92–98. Prapavessis, H., Grove, J., McNair, P., & Cable, N. (1992). Self-regulation training, state anxiety, and sport performance: A psychophysiological case study. Sport Psychologist, 6, 213–229. Rushall, B., Hall, M., Roux, L., Sasserville, J., & Rushall, A. (1989). Effects of thought content instructions on skiing performance. The Sport Psychologist, 2, 283–297. Ryan, M., & Gevirtz, R. (2004). Biofeedback-based psychophysiological treatment in a primary care setting: An initial feasibility study. 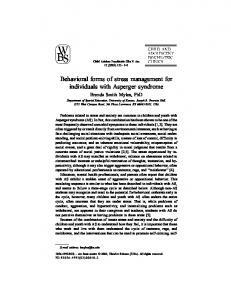 Applied Psychophysiology and Biofeedback, 29, 79 –93. Scanlan, T., Stein, G., & Ravizza, K. (1991). An in-depth study of former figure skaters: II. Sources of stress. Journal of Sport and Exercise Psychology, 13, 103–120. Schmidt, R., & Lee, T. (1999). Motor control and learning: A behavioral emphasis (3rd ed.). Champaign, IL: Human Kinetics. Schmidt, R., & Wrisberg, C. (2000). Motor learning and performance (2nd ed.). Champaign, IL: Human Kinetics. Schmidt, R., & Young, D. (1987). Transfer of movement control in motor skill learning. In S. Cormier & J. Hagman (Eds. ), Transfer of learning: Contemporary research and applications (pp. 47–79). San Diego, CA: Academic Press. Schwartz, M., & Andrasik, F., (2003). Biofeedback: A practitioner’s guide (3rd ed.). New York: Guilford Press. Silverman, W., & Treffers, P. (Eds.). (2001). Anxiety disorders in children and adolescents: Research, assessment, and intervention. New York: Cambridge University Press. Strack, B. (2003). Effect of heart rate variability (hrv) biofeedback on batting performance in baseball. Dissertation Abstracts International, 64 (03), 1540B. Suinn, R. (1976, July). Body thinking for Olympic champs. Psychology Today, 36, 38 – 43. Suinn, R. (1980b). Psychology and sports performance: Principles and applications. In R. Suinn (Ed. ), Psychology in Sports: Methods and Applications (pp. 26 –36). Minneapolis, MN: Burgess. Suinn, R. (1980a). Muscle relaxation exercise. In R. Suinn (Ed. ), Psychology in sports: Methods and applications (pp. 310). Minneapolis, MN: Burgess. Suinn, R. (1984). Visual motor behavior rehearsal: The basic technique. Scandinavian Journal of Behaviour Therapy, 13, 131–142. Suinn, R. (1987). Psychological approaches to performance enhancement. In M. Asken & J. May (Eds. ), Sports psychology: The psychological health of the athlete (pp. 41–57). New York: PMA. Suinn, R. (1989). Behavioral intervention for stress management in sports. In D. Hackfort & C. Spielberger (Eds. ), Anxiety in sports: An international perspective (pp. 77–94). New York: Hemisphere. Suinn, R. (1990). Anxiety management training: A behavior therapy. New York: Plenum Press. Suinn, R. (1997). Mental practice in sport psychology: Where have we been, Where do we go? Clinical Psychology: Science and Practice, 4, 189 –207. Suinn, R., & Deffenbacher, J. (1980). Behavioral intervention methods for stress and anxiety. In I. Kutash & L. Schlesinger (Eds. 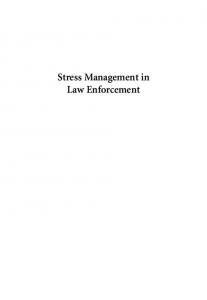 ), Handbook on stress and anxiety (pp. 392– 412) . San Francisco: Jossey-Bass. Suinn, R., Morton, M., & Brammell, H. (1979). Psychological and mental training to increase efficiency in endurance athletes. Final Report to the U. S. Olympic Women’s Athletics Developmental Subcommittee. Fort Collins, CO: Colorado State University Swain, A., & Jones, G. (1996). Explaining performance variance: The relative contribution of intensity and direction dimensions of competitive state anxiety. Anxiety, Stress and Coping, 9, 1–18. Tenenbaum, G. (2003). Critical elaboration and empirical investigation of the cusp catastrophe model: A lesson for practitioners. Journal of Applied Sport Psychology, 15, 144 –159. Terry, P., Coakley, L., & Karageorghis, C. (1995). Effects of intervention upon precompetition state anxiety in elite junior tennis players: The relevance of the matching hypothesis. Perceptual and Motor Skills, 81, 287–296. Thelwell, R., & Maynard, I. (1998). Anxiety–performance relationships in cricketers: Testing the zone of optimal functioning hypothesis. Perceptual & Motor Skills, 87, 675– 689. Tyrer, D. (1999). Anxiety: A multidisciplinary review. London: Imperial College Press. Ward, D. (1997). The effects of an individual audio mastery rehearsal tape on self-confidence and anxiety of intercollegiate varsity swimmers. Dissertation Abstracts International, 57 (07), 4738B. Weinberg, R., & Gould, D. (1995). Foundations of sport and exercise psychology. Champaign, IL: Human Kinetics. Wells, B. (1996). Coping with sources of acute stress in sport: The role of cognitive appraisal, personal dispositions, and situational characteristics. Dissertation Abstracts International, 57 (02), 1490B. Williams, M., & Elliott, D. (1999). Anxiety, expertise, and visual search strategy in karate. Journal of Sport and Exercise Psychology, 212, 362–375. Wolpe, J. (1982). The practice of behavior therapy. New York: Pergamon Press. Woodman, T., Albinson, J., & Hardy, L. (1997). An investigation of the zones of optimal functioning hypothesis within a multidimensional framework. Journal of Sport & Exercise Psychology, 19, 131–141. Yerkes, R., & Dodson, J. (1908). The relation of strength of stimulus to rapidity of such habit-formation. Journal of Comparative Neurology and Psychology, 18, 459 – 482. Report "Behavioral Intervention for Stress Management in Sports"